Back in 2007, when I was a full-time stay-at-home-dad, I was at a neighbor’s house for their four-year-old daughter’s birthday party and had an unforgettable experience. For tons of toddler fun, my neighbor had an inflatable climb and slide in the backyard where the kids were clamoring their way to the top and rushing down the other side. While helping my neighbor police the excitement, I saw a six-year-old boy jump off the top of the slide and land on his sister’s head. Knowing him from around the neighborhood, I addressed him straight-away and informed him that he would be losing his next turn because of his behavior. Without even a thought, he looked up at me and flipped me off with his middle finger! Looking around for some help from his parents I realized that not only were his parents not present at the party but that it would indeed be a complete waste of time and energy to track them down and inform them of his indiscretion. Why? Because I had just met his parents through him. When I say power I don’t mean some mystical force of nature that cannot be understood or maintained I mean the ability or capacity to do something. Piecing this together, parenting has the ability or capacity to do some things to our children. Now what things is up to the individual parents, but there are 3 powers that every parent possesses that are shaping the course of their children’s destiny. Your nature is your temperament or intrinsic disposition. If you’re positive, your child will be positive. If you’re negative, your child will be negative. The way you are is the way your child will be. I grew up in a home where we criticized and complained about almost everything. It was our “normal” and it served as our most basic form of communication. I didn’t know it was that way until my best friend informed me when I was 17 years old that he didn’t like hanging out at our house much because of the negative vibes he received. It took that comment for me to become aware of what was happening and begin to change the way I communicated with my family and friends. It was a long journey to recovery from the critical spirit I received from my parents but it started with my own self-awareness and willingness to change. Action Step: So, what is the condition of your home? Is it critical and demanding or encouraging and empowering? Ask someone outside of your home to help you assess the condition of your personal temperament and your family’s condition. Give your children a positive future by changing the way you relate to the world around you. I like to define character as what others have come to expect from you. Character, in this definition, can be either positive or negative and is often a mixture of both. A person’s character is fueled by the way they think. 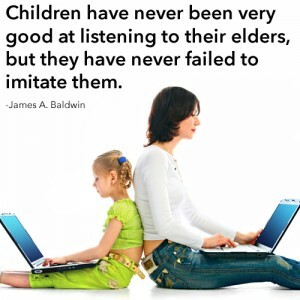 That is why parenting has the power to reproduce children that think like you. This is where we get the phrase “like father, like son,” and other variations. Because of the great influence we hold over our children, it is impossible for them to separate their thinking from our thinking. What they have come to expect from us is what they have come to expect from themselves. In a sense, the character development of our children is a bit like passing the baton. That is why cycles of abusive and addictive parents perpetuate themselves in their children. It is the child’s expectation that life works the way his parents taught him so he creates his world based on the beliefs, values and morals he has been given. Action Step: All parents are leaders. But not all leaders are worth following. Leaders worth following are those who have an encouraging and empowering affect on those around them. So what have people come to expect from you? What is the character that you display to those around you? Ask some close friends and family members for a reality check. And if you can stomach it, ask your kids (if they’re mature enough to field the question, of course). The first step in the development of your character is knowing where you are. Then you can make a plan to get where you want yourself and your kids to be. Behavior is defined as the way in which a person responds or reacts to a certain set of conditions. In other words, behavior is how we act. In this way, parenting has the power to reproduce children that act like us. This takes us back to the six-year-old boy’s middle finger incident. Where did this child learn that from? Why did he feel so brazen in his use of it? Where did he get such a genuine disrespect for authority from? The answer to all of these questions is his parents. You see, whether or not we realize it, everything we do is something that our children deem as alright for themselves to do. Remember, observable behavior has to do with how we respond or react to situations. This boy had seen his parents in situations similar to this respond with a disdain for authority. Whether or not their reactions included a middle finger manifestation, I don’t know, but I do know that this child’s behavior was informed by his example. Action Step: It’s time to take a look in the mirror. And by that, I mean take a good hard look at your children. How do they behave? Do you approve? Is there a recurring aberration that you have with any of your children that causes you to get frustrated? Your answers to these questions and your careful observation will help you to identify areas of your own life where you may need to clean up your act. The bottom line here is this: kids only do what they know. And what they know comes directly from their parents. If you don’t like what you see in your kids, don’t get mad at them, change yourself. 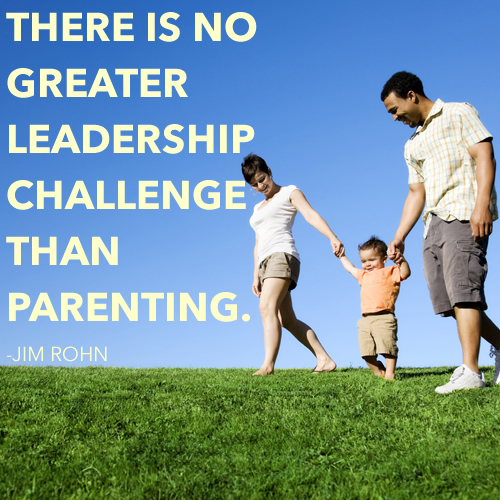 Question: What tried and true lessons have you learned about leading your children? You can leave a comment by clicking here. This is a very true article. Children grow up to mimic their parents in very many ways, even though they think their parents know nothing and are behind the times, etc… We brought up our kids with God in the center of our family, and it shows in their lives in many ways. I feel very blessed by my children, and am proud of them in all they do because they have God in the center of their lives. It shows in many ways. Thanks, Mike! It’s very true that when we give our children a purpose higher than themselves that they’ll be more positive and productive as adults.